NETWORK FINALS: FOX’S Big 10 Championship COLLEGE FOOTBALL game adjusted to 2.7, and ABC’s ACC Championship ended up at 1.6. Both CBS’s reruns of NCIS: NEW ORLEANS and CRIMINAL MINDS fell 0.1 in final numbers. CABLE HIGHLIGHTS: With college football on the broadcast networks for the night, Saturday’s cable crown went to the latest Hallmark holiday movie, A DREAM OF CHRISTMAS at 0.62. Nickelodeon’s 10:30AM SPONGEBOB was impressive at 0.50, and the same network’s primetime HENRY DANGER was at 0.43. Adult Swim’s late night animation block was as follows: DRAGON BALL Z up 0.07 to 0.61/1.426M, JOJO’S BIZARRE ADVENTURE up 0.08 to 0.48, MOBILE SUIT GUNDAM up 0.07 to 0.42, HUNTER X HUNTER up 0.04 to 0.38/845K, NARUTO down 0.01 to 0.31/726K, ONE PIECE down 0.01 to 0.27/640K, and ONE PUNCH MAN down 0.05 to 0.24/611K. Fox Sports 1’s UFC was at 0.41, with the PRELIMS at 0.33. Even though it shouldn’t be on the chart, it’s worth noting that HBO’s BATMAN V. SUPERMAN, which has been in heavy rotation on the network for a week or so, still managed to hit the Top 10 with a 5:40PM airing at 0.38, just slightly below the primetime premiere of KEANU at 0.42, which led in to a PETE HOLMES comedy special at 0.15. HGTV’s HOUSE HUNTERS RENOVATION gained 0.06 to 0.36. Univision’s LIGA soccer match was at 0.35. The Food Network morning block had PIONEER WOMAN up a tenth to 0.32, TRISHA’S SOUTHERN KITCHEN up 0.09 to 0.27, KITCHEN AT FN up 0.03 to 0.26, and VALERIE’S HOME COOKING up 0.03 to 0.20. Spike’s COPS returned from a week off down 0.13 to 0.30, and BELLATOR LIVE was at 0.18. 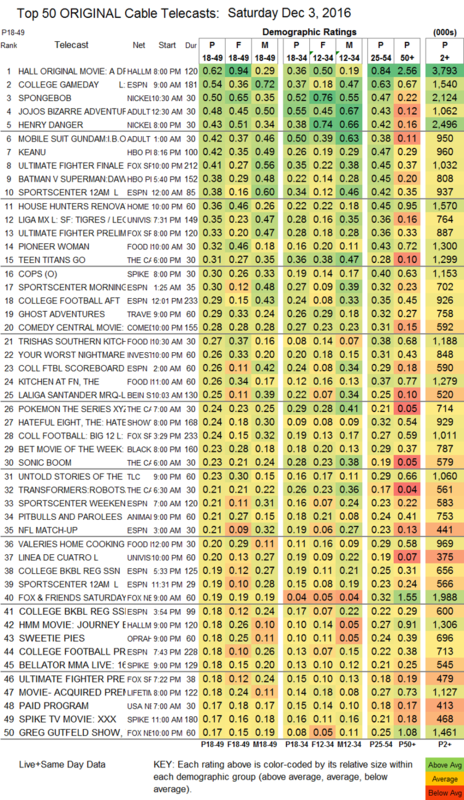 TLC’s UNTOLD STORIES OF THE ER was at 0.23, up from last week’s 0.21/0.20. BBCAmerica’s DIRK GENTLY’S HOLISTIC DETECTIVE AGENCY climbed 0.03 to 0.11.